Anyhoo, today I'm sharing a card I made for the current CASology challenge. When I saw the cue card being Art. I thought this could go a number of ways...having the word Art in the sentiment, or having some kind of Art supplies stamped on the card, etc. So for my card, I chose to showcase a piece of Art(work). My posting and commenting has been a little all over the place lately. Not just because summer and playing with my kids, but I'm trying to stay ahead on some DT work as well. ;) So please bear with me...comes August things will start to be more on track. Thanks! Awesome art!!! Love it!! I'm guessing you have air conditioning! It's been 93 here in Michigan and I do not have air conditioning, so I'm really not liking this warm summer we are having here!! No worries about commenting, Shelly (says someone who is so far behind it's embarrassing *grin*). We all understand 'life'! Your days sound jam-packed with 'summer' adventures; I can't believe you're getting up at 3:30am! Your heart-globe card is sheer delight! Sweet, fabulous and yes, artsy awesome! Hey Shelly!! I with you!! I love summer so much!! I wish it could be this warm everyday. I would love it. Great coloring and I love your interpretation of the cue card. Nicely done. 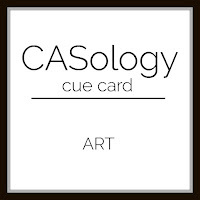 Thank you so much for playing with us this week at CASology. I LOVE your take on the cue this week Shelly! So glad you joined us at CASology this week! Waffle Flower + Xyron Inspiration Week!